With the epic production of "The Crossing at Blaisdell Park" having made headlines around the world, and billions taken at the box office, the production of the sequel was well under way. Kate Stanton’s husband Paul was the producer with Finn as his sought after director. Hugely successful, it seemed everyone wanted a slice of the film studio’s success – but then things began to go wrong. Esme’s period costumes were stolen and the van driver was found murdered. Time was not on their side with shooting of important scenes due to start…When Finn and his wife Diane were selling their exclusive home, Eve, Kate’s daughter was the agent. The evening Eve’s daughter Karen and her cousin Liz went to open the home for prospective buyers, they had no idea the dreadful tragedy which would unfold – the sequence of events continued to stun everyone, including the police. With the rumours flying that Charlotte, the ghost of the movie's heroine was haunting the making of the sequel, disastrous events continued to occur. As the deeply buried past of some of Hollywood’s rich and famous began to surface, it was obvious there was a killer out there who was intent on removing many members of "The Crossing…" But why? What was it that was so wrong about everything that was happening? What was the truth about "The Crossing at Blaisdell Park"?This latest release by Marta Tandori is a murder mystery with a difference. Revolving around the film industry in Hollywood – all the intricacies involved in the making of a movie; from the costumes, lighting, scripts and more. There were many twists and turns which made it gripping and tense; but I did find that there were a large amount of characters to keep track of, and I found that difficult at times. The Crossing at Blaisdell Park is the 4th in the Kate Stanton mysteries and an enjoyable read.With thanks to the author for my copy to read and review. 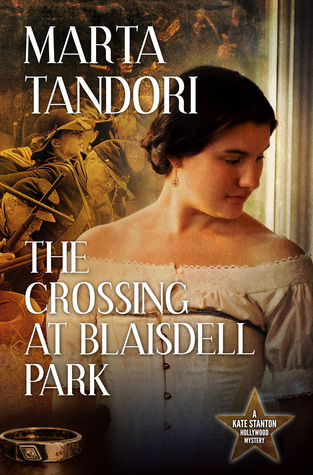 This is a ghost story ... it's also a love story .. and it's also a mystery.The Crossing at Blaisdell Park is a blockbuster Civil War epic movie that's taking the movie industry by storm. Kate Stanton is married to the movie's producer and is the only surviving member of a 60s band. Just as Whitney Houston's song made The Bodyguard, Kate will be performing one of the group's song for the movie.Strange little things start happening as the movie is being made ... small irritating things. And then a young lady is murdered ..... while she was wearing a costume based on the main character of the movie ... Charlotte. Some say the movie is haunted. Maybe it is .....Very interesting book! I actually learned lots about the making of a movie ..or as close to it as I'll ever be. I liked the characters .... some were kind of quirky, some really enmeshed into the movie business, and one who had a secret agenda to expose some secrets. Then there are the greedy people ... and of course, Charlotte, the ghost.The book is well-written. The mystery and tension is steady throughout the book .. maybe with a couple of surprises thrown in for good measure. I think Kate Stanton is a great character to base a series on. Here's hoping we see much more of her. The previous Kate Stanton books to look for are: TOO LITTLE, TOO LATE - THE TIES THAT BIND and NO HARD FEELINGS.Many thanks to the author, Marta Tandori, for the ARC e-book to read in exchange for an honest opinion. I got this book from the author is exchange of an honest review.I gave this book 3 1/2 stars rounded to 4 stars.The story begins with a serie of unconnected accidents, that happens during the shooting of a sequel to an acclaimed movie. The accidents seemed related somehow to the story of the main character of the movie Charlotte Valcour.Things get a bit complicated when an actrice dressed as Charlotte Valcour is murdered.The story started a bit slow paced, only few accidents that seemed of no real importance. I liked the insight into the movies industries as all the characters were introduced, and i enjoyed those anecdotes about some blockbuster movies! !But during the first chapters i almost forgot that it was a thriller, and the first murder really took me by surprise . After that the story took a different turn, became more interesting and fast paced!Many coincidences appeared and i kept wondering what's the relation between all these events.There were some parts that bothered me a little bit, at some point the history of a character is told and then the same story is told again (in a different context) at the same way, i felt it was like a repetition, and this happened twice.and i found that the end was an easy one, that happened really fast!Aside from this the book was a good one and really interesting and i surely will read more of Kate Stanton Hollywood mysteries! Thank you to the author for providing me an electronic copy of her book in exchange for an honest review. First of all, I like some of the other readers, usually hate reading series books out of order, but I did not feel that I missed anything by starting with book 4. It was a great stand alone book. I thought the beginning was a little slow, and it took me about 90 pages or so to actually start getting into it. I also got confused at times with so many characters and who was related to whom and so forth. I almost wanted to make a family tree just to keep up. And then I was really confused when the killer ended up having two identities! I felt that the author had a lot of unnecessary chatter about the making of costumes and police jargon...it bored me and I wanted to skip to the juicy parts. About 2/3 of the way through the, I finally was able to get the flow, and couldn't put it down, anxious to see what would happen next. It took a while, but I was finally invested in the characters and could feel their anxiety, pain, and happiness. Overall, it's an easy read once you get past the first 65 pages or so. I would recommend it for a rainy afternoon or simply just as a time passer. I've not read anything by this author before, so didn't really know what to expect. I'd read a couple of reviews which were quite contradictory so I tried to keep my mind open. I really liked the way the story merged past and present, and kept going from character to character to tell the story. There were times when it wandered a bit, and some bits that strayed from the plot altogether, but it did keep me guessing most of the time, and I would very much like to read the rest of the series so far! Well worth a read in my opinion and thank you! This murder mystery was a case of past sins coming back to haunt the rich and famous in Hollywood. Crimes mirrored scenes within a movie being made. There was fascinating detail on different aspects of movie making, especially costume design. A very enjoyable read. My only complaint would be the number of characters to try and keep tabs on. I am really really conflicted about what rating to give this book. As you can see from the categories it is a hodgepodge and the plot is like Ouroboros, the snake eating itself, as everything keeps folding back into the center in a deranged circular style. Loosely the book has two main plots one is the sale of a massive Holmby hills home by Kate Stanton's agency and the other is the production of a film the Crossing at Blaisdell Park - a civil war costume drama. The director of the film and his wife own the house - which they don't live in. When Kate & co are preparing for a broker's open they discover a corpse of a woman dressed in a costume from the movie whipped to death - like a scene in the movie. Luckily Kate's daughter's boyfriend is a homicide detective. And he's already been involved with the movie because a driver for the studio was murdered - the studio owned by Kate's second husband. Kate knows about this because she was at the dressmaker; who is also the costumer for the film, when the police showed up to investigate. And don't worry it gets much much much more 'coincidental' the murdered woman is the aunt of the personal trainer of the director's wife - who was also in rehab with the driver whose mother in law works for the costume designer. And there are more to come. Is it interesting yes; is to perhaps too tightly woven? DefinitelyAnother peeve was the author's consistent use of bizarre research to substitute as real dialog. There is a scene where the costume designer relates every step involved in making a costume. And another where the realtor explains the risk and reward of listing a multi-million dollar home. Then there are the scenes where the director has to explain to his cast what their motivation is to do the scene and further actual excerpts of the screen play.. I don't care.It was like the origin story in a superhero movie... how many times do we need to see Peter Parker bitten by a spider or Superman coming to earth from Krypton? This is extraneous information that didn't add to the plot. Captivating mystery with plenty of twistsThis is book four of the Kate Stanton Hollywood Mystery series and is a mix of drama and mystery/suspense over a killer and his motive for trying to wipe out key individuals. The Crossing at Blaisdell Park will begin with the epic successful Civil War film that spiked such a huge success prompting a sequel production. This production named The Crossing would prompt interest in Kate Stanton, the surviving member of the former 60s musical the Paisley's. As Kate prepares for her Hollywood Walk of Fame a mysterious man will emerge that stole a van and murdered the studios regular driver. He also jumped the curb killing a woman dressed as Charlotte Valcour for the movie. Word has it that the murder has gang affiliation.As the drama unfolds with twists, discover if the rumor is true about a ghost of the movies dead heroin harboring around the production. In a critical time where The Crossing's actors are in full force it will be discovered that the director of the movie mysteriously disappears. This occurred during a key battle scene.Discover who the killer is and why the intent is to wipe out the cast of The Crossing. If you enjoy mystery/suspense novels this entire series is well worth exploring. Author Marta Tandori is living her passion of writing fiction where she has a flair for engaging the reader. When you think you have figured out the mystery Tandori will provide twists and clues that will keep you on your toes until the end.Check out her Facebook page and author page and all her excellent works with bargain prices on her Kindle editions. I recommend this book and give it five stars for a well-developed mystery plot. This is the fourth book in the Kate Stanton series, but the first one I've read. I didn't get the feeling from the book that I was missing anything, not having read the previous books, but my brain, which does like to read things in order, kept obsessing about it.There was a lot to like about this book. I was drawn to the characters. I cared about them, and about what happened to them. The pacing of the novel got good...it did start a little slow, but once it picked up, it stayed strong. It was easy to read. I was interested in the story and what happened next, so it was difficult to pick a place to stop so that I could go to bed.There were some things I didn't like about this book. There were times that the dialogue got very cheesy and juvenile. At those points, I had to remind myself that this was a book for adults. I also felt that there were certain aspects of police procedure, or filming, or other aspects of the book that were over-explained. It made the characters seem silly or younger than they were written. Overall, I did like this book. There were some spelling and grammar errors that I picked up, so hopefully there was a final edit before going to print. I do think I will look into reading the other Kate Stanton books, because I did enjoy her as a character. I would recommend this book, especially as a vacation book. It would be a really good addition to a long plane or car ride, as well as lounging by the pool. **Many thanks to the author, Marta Tandori, who provided me with an ARC e-book version in exchange for an honest review. This is the fourth book in the Kate Stanton series, but it is the first one I have read. I thoroughly enjoyed this book and do not feel that I missed anything not reading the previous ones.The Crossing at Blaisdell Park was a huge box office hit and the sequel is now in production. Finn, the director, wrote the movie based on his ancestor's story. Diane, his wife is teaching acting classes where Karen is honing her craft. Kate, whose song from her years with the Paisley's, received aclaim after being used in The Crossing and she is receiving a star on the Hollywood Walk of Fame. Her husband, Paul, is the producer of both movies and her daughter Eve is trying to sell Finn and Diane's house. There are several murders, which John, Eve's boyfriend, is trying to solve and they all seem to tie into the movie and/or Diane in some way. Who is killing these people and why? Who else is in danger? Can past sins come back to haunt the rich and powerful in Hollywood? This book kept me on the edge of my seat and I will definitely keep my eyes out for the others in this series.I received a copy of the book from the author in exchange for an honest review. This did not influence my rating in any way. I would like to thank the author, Marta Tandori, for giving me an electronic copy of this book to read and review. Although this is the continuation of a series about Kate Stanton, it reads more like a stand alone book. Having not been exposed to Kate Stanton before, I did not feel that I was missing out. The biggest problem that I had with reading The Crossing at Blaisdell Park was the multiple grammatical and spelling errors. For me, it ruins the flow of a novel when my eye is constantly catching on problems with sentence structure or spelling. The pacing was a bit sluggish at the beginning, but accelerated to a smooth speed as the novel progressed. As a whole, the character of Kate Stanton is likeable and I would very interested in reading the books before this one to find out more about her. I did think that the author spent too much time explaining certain parts of the story, such as going into too much depth about filming or police procedure. It slowed the plot down and I felt it just was not necessary. As a whole, this was a quick read and one that I would recommend if you like reading mysteries at the beach or with your afternoon tea. Thanks to Goodreads and the author for my copy of this book.This isn't a bad book, but I just couldn't buy into the underlying premise, that the movie described or the 50-year-old folk song would ever be that successful. This alone wouldn't really be an issue, but I also found the characters not particularly interesting or likeable.The author uses dialogue for a lot of exposition, leading to some characters sounding idiotic, as when Kate, wife of a big-time Hollywood producer, claims not to remember what a "run-through" is while at the set and must have the term explained to her. Also some stilted and unrealistic dialogue between friends containing explanations of who people are, etc., which are not what a real person would say. Necessary exposition should be given through descriptive paragraphs.There are quite a few typos in my copy. I received a copy in exchange for a review.Praise: This story was put together really well. There was enough going on to stay interesting. The mystery was complex and multi-faceted: You wondered what these odd events had in common and why they were happening instead of merely wondering who did a crime. The characters were mostly very nice people; you didn't feel like smacking them.Criticism: The story was not proofread at all; I don't know if it will be before final release. (If it was, the author got totally ripped off and should demand a refund.) Therefore, there are tons of errors in punctuation, spelling, and grammar. This was distracting to me, but I'm a grammar nazi. Otherwise, I got some of the similar names mixed up (Eve/Esme and Karen/Kate), but the story itself was solid.I haven't read the rest of the series, and I don't feel like I was lost as a consequence. Although this book is part of a series, it does just fine as a stand-alone. The Crossing at Blaisdell Park is so well crafted! The writing is clever, it moves along at a good pace, and best of all, it has a complex plot that holds your interest and keeps you turning the pages. Kate Stanton is the last surviving member of a super popular 60s band. She has agreed to do one of the band's signature songs for a movie called The Crossing at Blaisdell Park. But mysterious things start happening and it seems that real life is mirroring the movie. Full disclosure: I received an advance copy of this book from the author in exchange for an unbiased review. Thank you to Goodreads and the author, Marta Tandori, for providing me with a signed copy of this book.This story had me captivated from the first page right through to the end. I found it very informative and interesting learning how Hollywood productions are made including details about day time soap operas. This mystery included an unexplained murder, thefts from a Hollywood set, love affairs; etc; the story had me anxiously reading to find out what would happen next. There were many twists and turns that kept me guessing all the way through. A surprisingly worthwhile read! I love this writer's style of writing and look forward to reading more from Marta Tandori. I received this book from the author in exchange for an honest review.I haven't read the previous books in the series, and before I started to read The Crossing at Blaisdell Park I thought that it would be a problem when it came to following the plot and characters, but it wasn't. There wasn't really any mention of the previous book and if there was it was in small detail and insignificant to the story. I really enjoyed reading this book, and I thought that the plot was very interesting. Marta Tandori - Marta Tandori had always been an avid reader but it wasn’t until she began studying acting in her early twenties at the American Academy of Dramatic Arts in New York that she realized acting wasn’t really her passion – writing fiction was. Thanks to an overly zealous addiction in her youth to all things Nancy Drew and Trixie Belden, Marta fell in love with mysteries and it’s hardly a surprise that she chose to write in the same genre! Marta’s books feature strong female protagonists who have closets full of nasty skeletons and the odd murder or two to complicate their already complex lives. She’s the author of the Kate Stanton Hollywood Mystery Series as well as several other standalone mysteries. To learn more about Marta, please visit her website at martatandori or her Facebook Author Page at facebook/MartaTandoriAuthor or connect with her on Twitter at twitter/MartaTandori (@MartaTandori).